I have been thinking a lot about women and their bodies this week. It first started with me and my own body and then trickled down to my friends, my mother and then the world. 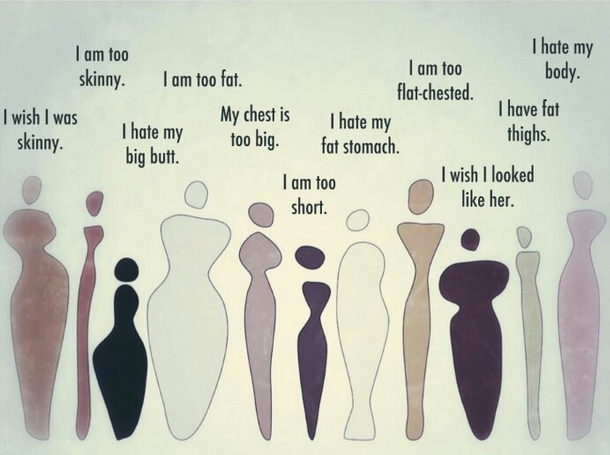 Why is it that women are so hard on themselves and their bodies? I can honestly say that this has been my life’s struggle to not only love my body, but really just to accept it. As I was talking to my friends the other day, we all acknowledged that we have tried extreme diets to either gain or loose weight, and still never felt whole. What happened to us along the way that we believe that we are not good enough? More importantly, what is the answer? I don’t know the answer, but I do know that it starts with talking about it. The more I talk about it with my friends and family, the more I realize that I am not feeling anything different than any other woman. That is comforting, but also alarming. I would love to hear anyone’s thoughts on practicing self love and acceptance.